The relationship between body mass and humerus length is remarkably consistent among modern humans and African apes (Jungers, 1994). Humerus length divided by the cube root of body mass does not distinguish among gorillas, chimpanzees, bonobos, African Pygmies and larger-bodied humans; rephrased in a slightly different manner, the interspecific log-log scaling relationship between these two variables is highly significant and isometric. 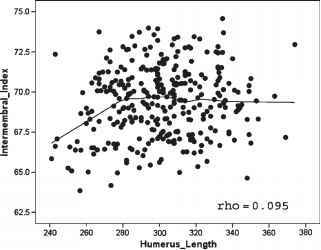 This perhaps surprising result indicates that humerus length itself can be used as a valuable surrogate for body mass or overall body size. I take advantage of this empirical finding to examine the scaling relationship between the humerofemoral and inter-membral indices and humerus length (much like Lovejoy  did with femur length) in order to evaluate the hypothesis that these interlimb indices are necessarily inversely correlated with "size" in humans. Fig. 9.5 Bivariate ln-ln plot of femur length (mm) on humerus length (mm). The parametric correlation coefficient is 0.9, and the reduced major axis (RMA) slope is 1.033. The 95% confidence interval includes the value of 1.0, indicating thereby an isometric scaling relationship (as was demonstrated in a different way in Fig. 9.3). Fig. 9.3 Bivariate plot of the humerofemoral index against humerus length (used here as a size surrogate, in mm). A Loess line is provided to guide the eye through the scatter of points. The relationship is not statistically significant as judged by a Spearman rank order correlation (rho). This indicates that that the humerofemoral index does not increase as size decreases (i.e., the relationship is isometric). Fig. 9.4 Bivariate plot of the intermembral index against humerus length (in mm). The same conventions apply here as in Fig. 9.3. The intermembral index does not change in a predictable manner with size. of points that are statistically uncorrelated (Spearman's rho = 0.095 in both). This lack of correlation between a shape variable (the index) and a size variable (humerus length) is what Mosimann and James (1979) define as "isometry." That is, shape fails to change in a predictable fashion with size. The Loess fit might suggest that both indices actually increase with humerus length initially and then change very little if at all afterwards. The important take-home message from this finding is that there is no increase in either index as size decreases. The predicted negative allometry between each index and size simply does not obtain for the total sample. Permutation-based 95% confidence intervals on the slope are 0.981 and 1.086. In other words, the relationship is best described again as isometric, just as it was using the Mosimann and James methodology. The expectation of negative allom-etry derived from the size-required hypotheses is firmly rejected regardless of how one approaches the problem. The Andaman Islander equation predicts an index of 67.6 for LB1 and 67.2 for A.L. 288-1; the Khoesan equation predicts 65.6 and 65.3, respectively. These values are obviously poor estimates of the known values (Table 9.1). Is the humerofemoral index the same as the intermembral index? What is the scale for a intermembral index of 65?